Engineers at Duke University have demonstrated a device that can direct photons of light around sharp corners with virtually no losses due to backscattering, a key property that will be needed if electronics are ever to be replaced with light-based devices. The result was achieved with photonic crystals built on the concept of topological insulators, which won its discoverers a Nobel Prize in 2016. By carefully controlling the geometry of a crystal lattice, researchers can prevent light traveling through its interior while transmitting it perfectly along its surface. Through these concepts, the device accomplishes its near-perfect transmittance around corners despite being much smaller than previous designs. The Semiconductor Industry Association estimates that the number of electronic devices is increasing so rapidly that by the year 2040, there won't be enough power in the entire world to run them all. One potential solution is to turn to massless photons to replace the electrons currently used for transmitting data. Besides saving energy, photonic systems also promise to be faster and have higher bandwidth. 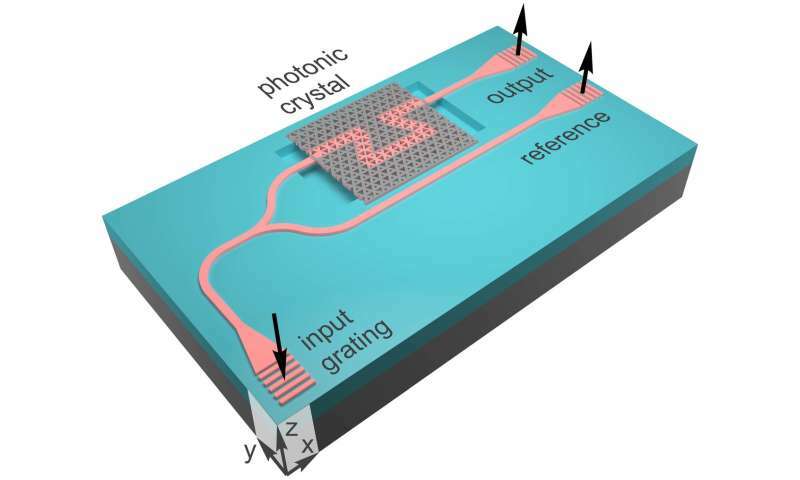 Photons are already in use in some applications such as on-chip photonic communication. One drawback of the current technology, however, is that such systems cannot turn or bend light efficiently. But for photons to ever replace electrons in microchips, travelling around corners in microscopic spaces is a necessity. "The smaller the device the better, but of course we're trying to minimize losses as well," said Wiktor Walasik, a postdoctoral associate in electrical and computer engineering at Duke. "There are a lot of people working to make an all-optical computing system possible. We're not there yet, but I think that's the direction we're going." 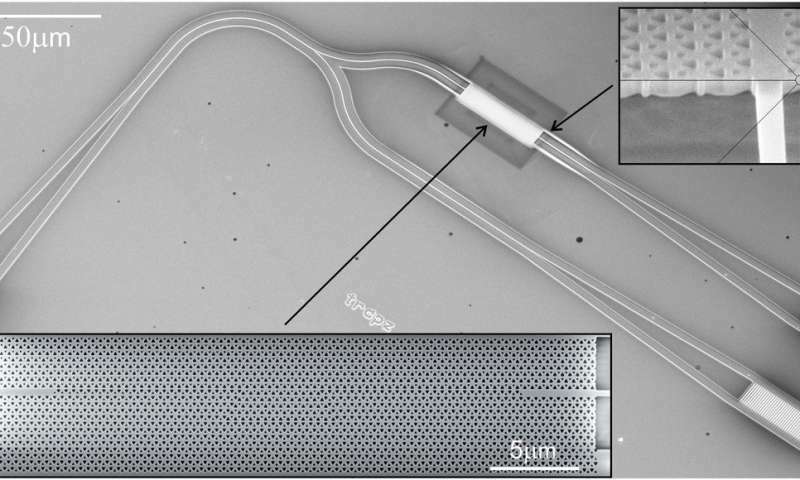 Previous demonstrations have also shown small losses while guiding photons around corners, but the new Duke research does it on a rectangular device just 35 micrometers long and 5.5 micrometers wide—100 times smaller than previously demonstrated ring-resonator based devices. In the new study, which appeared online on November 12 in the journal Nature Nanotechnology, researchers fabricated topological insulators using electron beam lithography and measured the light transmittance through a series of sharp turns. The results showed that each turn only resulted in the loss of a few percent. 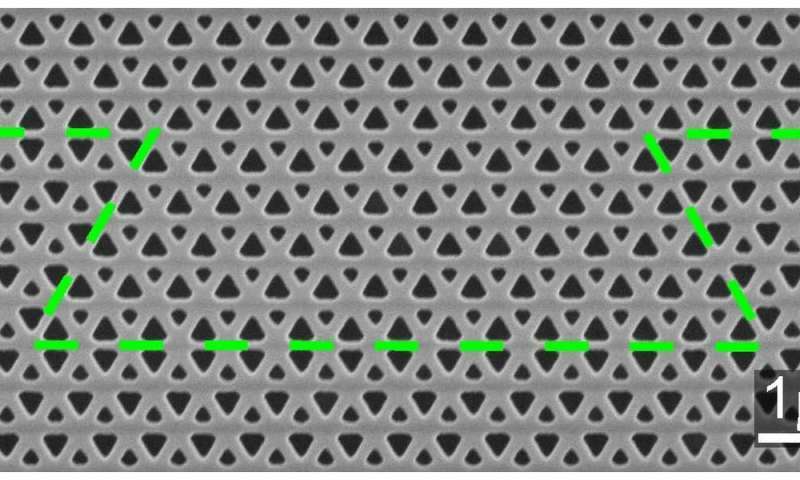 "Guiding light around sharp corners in conventional photonic crystals was possible before but only through a long laborious process tailored to a specific set of parameters," said Natasha Litchinitser, professor of electrical and computer engineering at Duke. "And if you made even the tiniest mistake in its fabrication, it lost a lot of the properties you were trying to optimize." "But our device will work no matter its dimensions or geometry of the photons' path and photon transport is 'topologically protected,'" added Mikhail Shalaev, a doctoral student in Litchinitser's laboratory and first author of the paper. "This means that even if there are minor defects in the photonic crystalline structure, the waveguide still works very well. It is not so sensitive to fabrication errors." The researchers point out that their device also has a large operating bandwidth, is compatible with modern semiconductor fabrication technologies, and works at wavelengths currently used in telecommunications. The researchers are next attempting to make their waveguide dynamically tunable to shift the bandwidth of its operation. This would allow the waveguide to be turned on and off at will—another important feature for all-optical photon-based technologies to ever become a reality.